"A Picture's Meaning Can Express Ten Thousand Words".The proverb suggests that words and pictures live in harmony as they are both to be used equally in order to understand the meaning of any work that uses them both. Addiction research is such work. The exciting advances in Neurobiology help us to understand Addiction is a disease. We, at Choopers, believe that the scientific community has broken though the barrier of words and theory into a new frontier where words and images now tell a new story about addiction. A story, if heeded, of understanding, compassion and hope that will lay a new foundation for treatment and recovery. 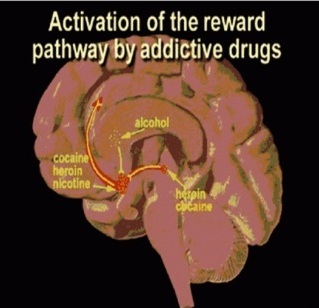 Each drug increases the activity of the reward pathway by increasing dopamine transmission. These drugs activate this particular brain pathway for reward they have the ability to be abused. Addiction is truly a disease of the brain. Reward deficiency syndrome comprises a spectrum of impulsive, compulsive, addictive and personality disorders that are based on a common genetic deficiency in the dopamine D2 receptor. Defects in the D2 A1 allele, a dopamine receptor gene are linked to these disorders.